François Zanella, a former coal miner from Morsback, Moselle in North Eastern part of France, built model boats in his spare time. 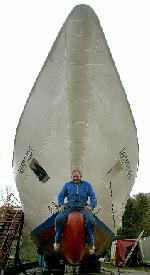 One day he decided to build a boat that was not a couple of meters long, but 33.5 meters…in his backyard. François‘ inspiration for this project was Royal Caribbean’s “Majesty of the Seas” built in 1992. François wanted his own mini version of the ship. On August 10, 1994, after 5 months and 3500 hours of drawing plans to ensure the ship would mimic the “Majesty of the Seas”, he began building. Word spread throughout France of François’ endeavor. One of the major television networks, France 3, created a TV special that covered the ship’s construction and François’ story. With his celebrity status came sponsorships from companies and other French citizens. In 1997, GESA Soudure and CARBOXYQUE, 2 companies headquartered in Forbach (Moselle) offered François a 1 ton soldering yarn and all the gas to finish the boat. 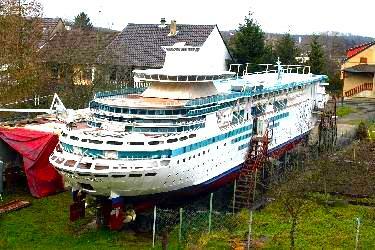 In 1999, marine construction company, TSV lifted the boat and landed it on concrete blocks. In February 1999 France Hélices (a leader in marine propulsion) offered François two propellers, which François estimated at its true worth. The next month a lumbering company based in Lachambre (Moselle) put in the bathroom installations. Over the years, assistance continued pouring in. Some of the things donated included: a trailer to fetch ceiling boards, panels and furniture, installations of 3 sleeping-rooms, a boiler, a hot water tank and radiators, glue for the portholes, the glass windows and the partitions and to insulate everything, connection equipment, a corner bathroom, a frescoe in the entrance hall, a rudder jack, a generator, and interior decorations. After 11 years, François’ dream was completed. He, along with his friends in the Moselle community, totaled 25,000 working hours to finish the ship, appropriately christened “Majesty of the Seas”. François welcomed by Mr Richard Fain, CEO of Royal Carribbean International. After completion, the ship was transported to the nearest sea port and on June 23, 2005 he set out to sea with his friends and fans from the port Sarreguemines. Francois is currently traveling around the world in his own cruise ship. Some genuinely fantastic posts on this site, thank you for contribution.